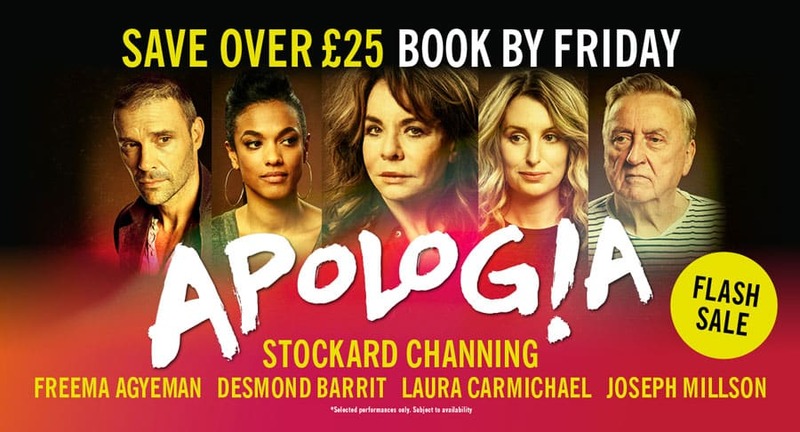 We are pleased to bring you this great opportunity to save up to 42% on tickets to see Stockard Channing in Alexi Kaye’s Apologia at Trafalgar Studios. This great discount is available on tickets booked before 1st December 2017. Tony and Emmy Award winner Stockard Channing, Freema Agyeman (Doctor Who), Olivier Award winner Desmond Barrit, Laura Carmichael (Downton Abbey) and Joseph Millson (The Last Kingdom) star in a new production of Alexi Kaye Campbell’s darkly funny play about family and its secrets. Alexi Kaye Campbell’s compelling drama follows his critical success with The Pride and his acclaimed plays Sunset at The Villa Thalia at the National Theatre and The Faith Machine at the Royal Court Theatre. Apologia marks the return to the Trafalgar Studios of Jamie Lloyd, following his critically acclaimed productions of The Ruling Class and Macbeth starring James McAvoy and his hit production with Martin Freeman of Richard III. Valid Thursday matinee and Monday to Thursday Evening between 30 August to 16 September.